It’s not uncommon when listening to Holly Golightly to have a little déjà vu. Sometimes you wonder if you’re listening to B-sides from scratched-up 78s you found in a trunk in your grandpa’s basement. 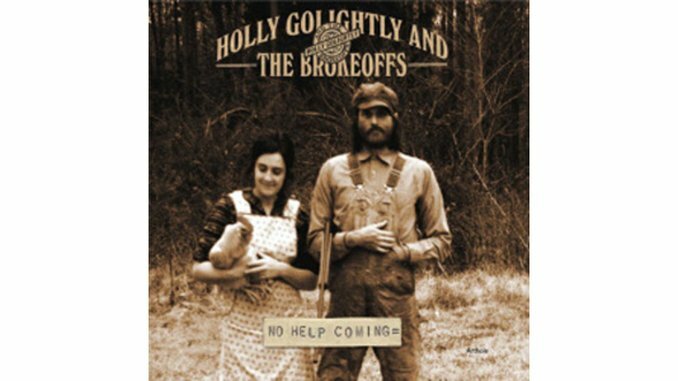 Sometimes you wonder if you’re listening to tracks off old Brokeoffs records. That’s a ho-hum remark on a record that’s actually full of subtle shifts in the Brokeoffs’ repertoire. Unlike on previous efforts, Lawyer Dave takes the reigns on several tracks (album closer and Wavy Gravy cover “LSD” being a highlight) and Golightly dips into the psychedelic swoon that colored her earlier solo work (“The Rest of Your Life”). There’s also a heretofore-untapped softness on “River of Tears” and a play at rockabilly balladry with “The Only One.” Of course, more typical Brokeoffs faire, like the scrappy “Get Out of My House” and the bluesy “Here Lies My Love,” make charming appearances too. You’d be hard pressed to find a better cover of Bill Anderson’s “Lord Knows We’re Drinking” than the one on this record. I thought a lot about that déjà vu quality and whether they’re recycling melodies and whether Holly Golightly belligerently lacks or dismisses ambition and I decided: I don’t care. Golightly and Lawyer Dave have curated an aesthetic that’s all about how they aren’t trying to sell you anything and have probably shored up their own intentions by not clouding their art with persona or moneyed PR handling. And sure, there’s a lot of calculation and branding in that exchange (hell, the record packaging is a nostalgic grab-bag), but so far it seems to have little to do with how great they are at writing clever country songs, playing with texture and tone, throwing down scraggly riffs or laying down two-part harmony. Déjà vu, ambition, whatever be damned. No help may be coming, but they don’t need it in the first place.